The Milanese soprano Barbara Frittoli has been a regular fixture at Covent Garden for a decade, during which time she has appeared in a variety of roles including Mozart's Fiordiligi and Vitellia and Verdi's Luisa Miller. After it closed for two years of refurbishment, she also took part in the House's reopening production of Falstaff as Alice Ford. Successes at Salzburg with Abbado and Vienna under Muti in the 1990s secured her position as one of the world's foremost lyric dramatic sopranos, with Verdi a specialty; she remains a favourite in Vienna and at the Met. Her discography includes roles in Il trittico for Decca and Turandot for BMG, while her albums of arias by Verdi (under Colin Davis) and Mozart (with Charles Mackerras) remain highly-esteemed examples of this repertoire on disc. Now Frittoli is back at Covent Garden to play the Countess in the second revival of David McVicar's production of Le nozze di Figaro under Mackerras, a regular partnership. I chatted to her on the eve of the dress rehearsal to ask her about her welcome return to London and her plans to add roles such as Aida and Thais to her repertoire. Frittoli's working relationship with Gianandrea Noseda will also continue this year at the Proms, where she will sing Puccini's Il tabarro for the first time. 'He pushed me so much to do it, but I'm not sure I will do it again. I certainly won't do it in the theatre, but I thought that since it's a concert performance it would be OK. I much prefer to do Suor Angelica and I would love to do that again. One should never say never, but if I started to play Giorgetta in Tabarro on the stage, they would ask me to do Lauretta in Gianni Schicchi as well, which needs a very young soprano and would make it a very long evening! How did it happen, exactly? 'Well, they had put me in the chorus, then when I was sixteen or seventeen they gave me a small solo part and paid me to do it – I was happy about that! It wasn't a huge amount, but it was not studying at all – no work, just money! The conservatoire pushed me to find a singing teacher. I said "No way!" because I had to spend so many hours on practising the piano. But I was not a very good pianist! I liked it, and the music would be in my head, but I could not get it out of the piano. 'Then it got to the point where the singing was so easy that I stopped playing the piano. My piano teacher was very grateful and thanked me for that! When I ask her what Frittoli would like her legacy to be, her reply is decisive: 'I would like to be remembered for my professionalism. This is very important to me. It's not enough just to have a nice voice and move nicely round the stage. 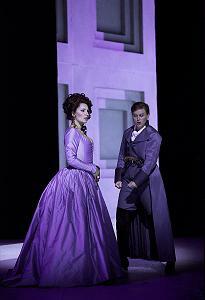 Barbara Frittoli plays the Countess in Le nozze di Figaro at Covent Garden from Tuesday 24 June.